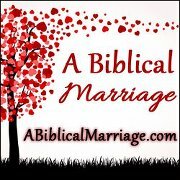 Have you seen this picture from Pinterest? 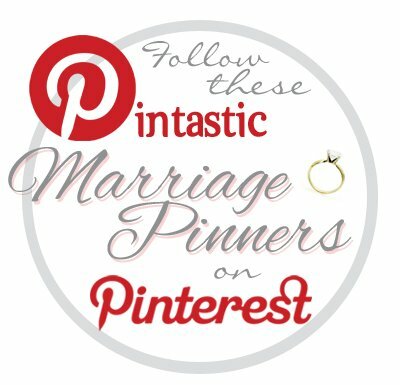 I pinned it and decided to make them! They were SO easy, and wonderful. 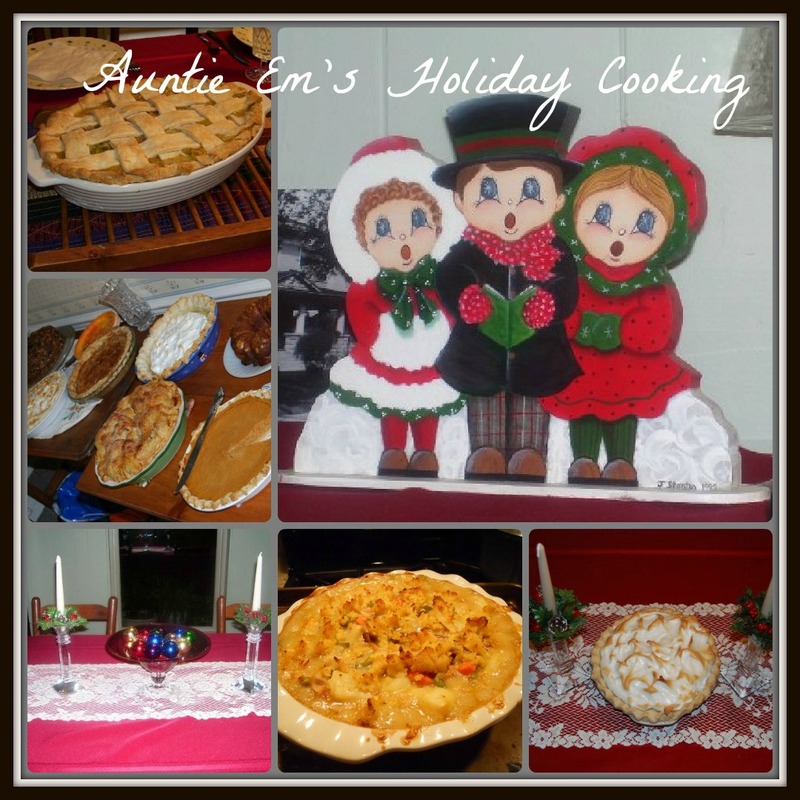 I decided to make some more for our family Thanksgiving dinner at Granny’s house. 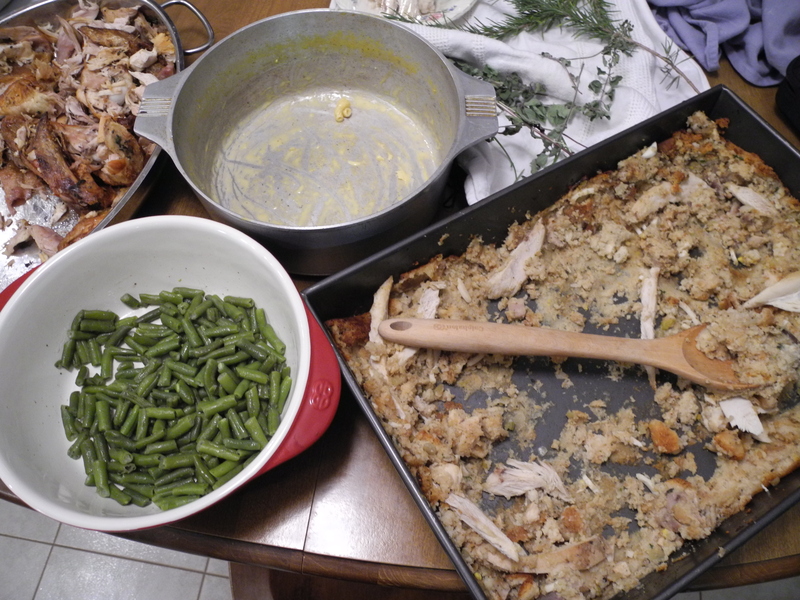 (By the way, in Texas, Thanksgiving DINNER is at noon, not in the evening.) 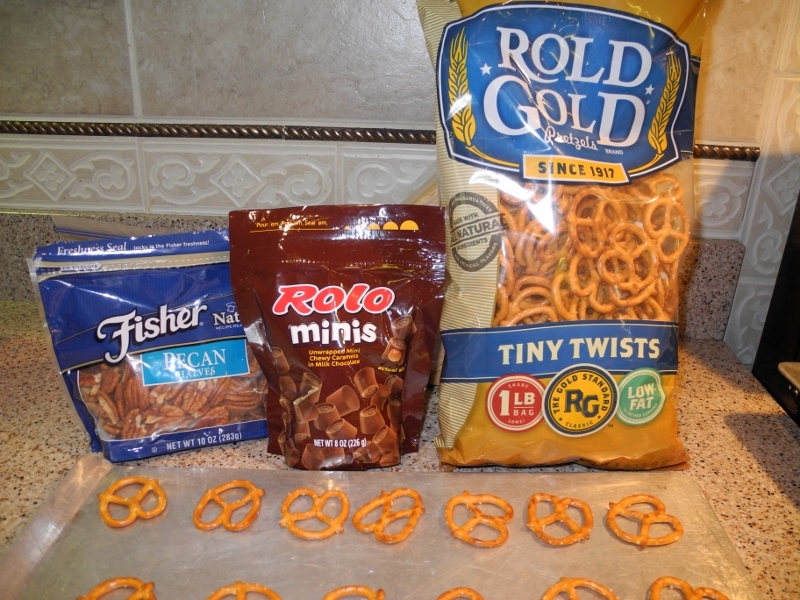 I got “mini” pretzels just like before, but noticed they were a good deal bigger than the last ones I used. Mr X said these are a different brand than before. Then I got out my bag of UNWRAPPED Rolos, which I was happy to discover because all that unwapping was a pain! I began placing them on the pretzels and noticed they were smaller than the last time. Mr X said, “See? It says MINI.” oops. All I saw was “unwrapped” and my laziness resourcefulness took over and I skipped over the much larger “mini.” However, my optimism decided that they will now be DIET candies. Here’s the skinny (HAH… get it? Diet candy?) on how to make them. 1. 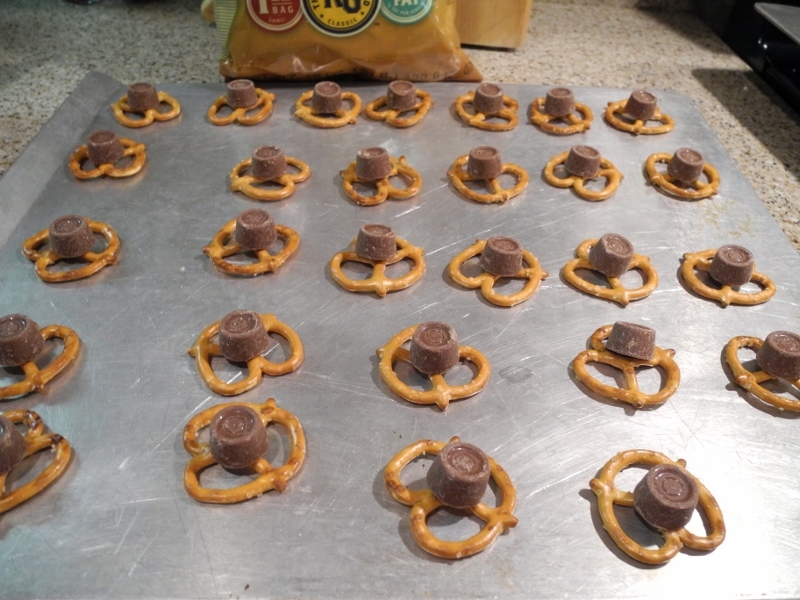 Place pretzels on a cookie sheet. In hindsight, I’d use one with sides. I got nervous moving this sheet in and out of the oven. 2. 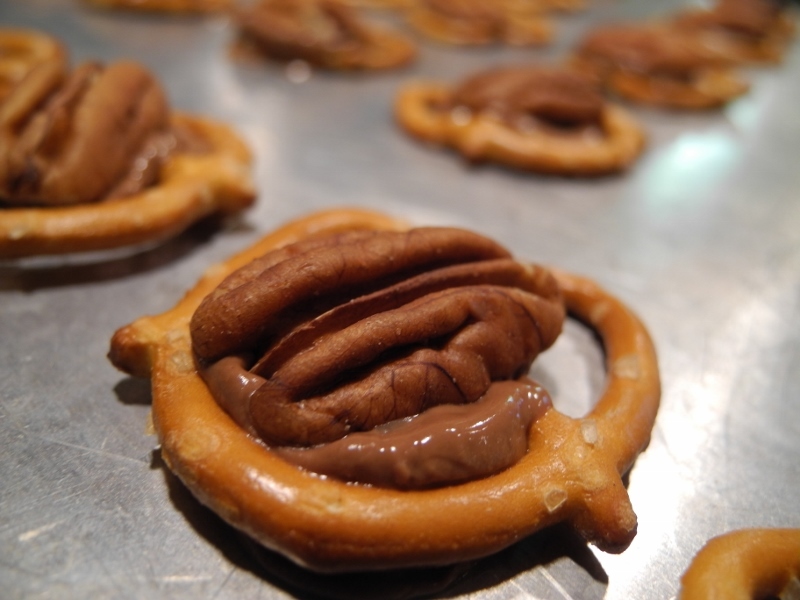 Put a Rolo on each pretzel. 3. Bake 3-5 minutes, till soft. If you use mini Rolos, it will be less time! 4. 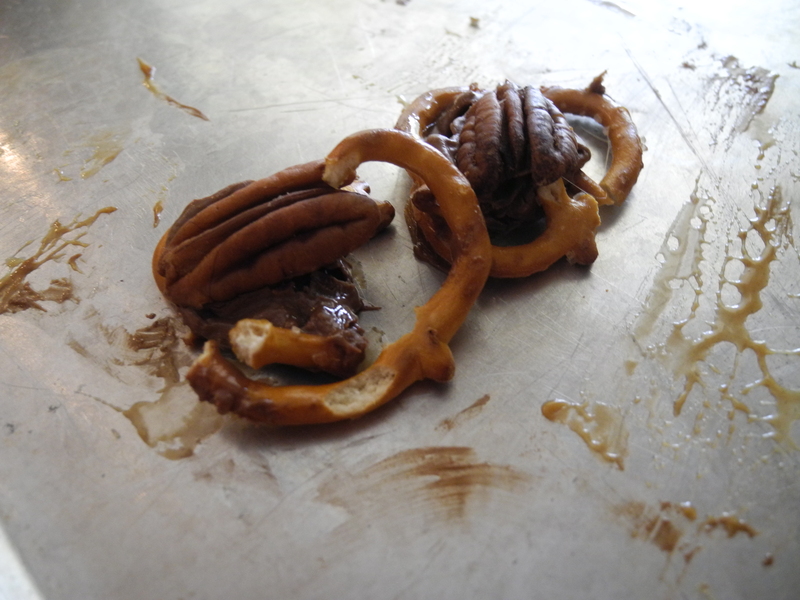 While they are hot and squishy, mash a pecan half into it. 5. Let cool and eat ’em up! 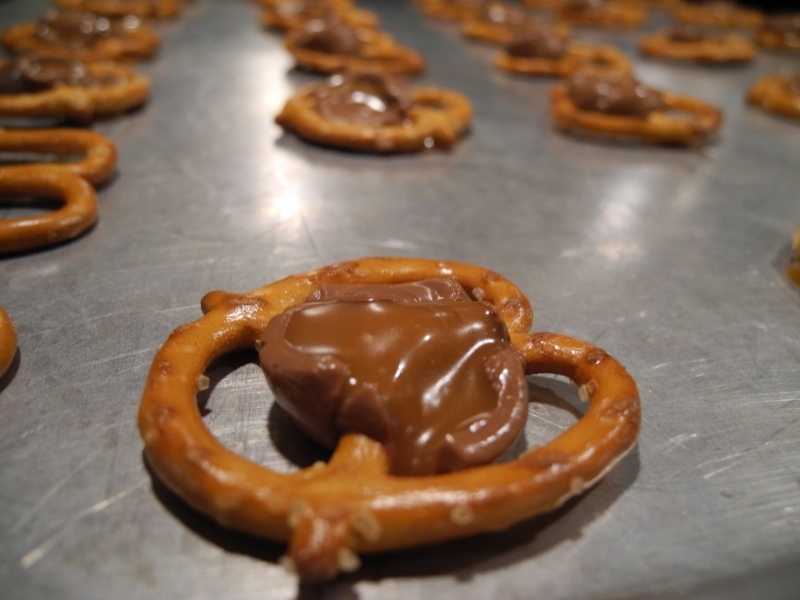 *NOTE If you use the large pretzels, the Rolos will melt down onto the pan and make removal difficult. Let it cool some. 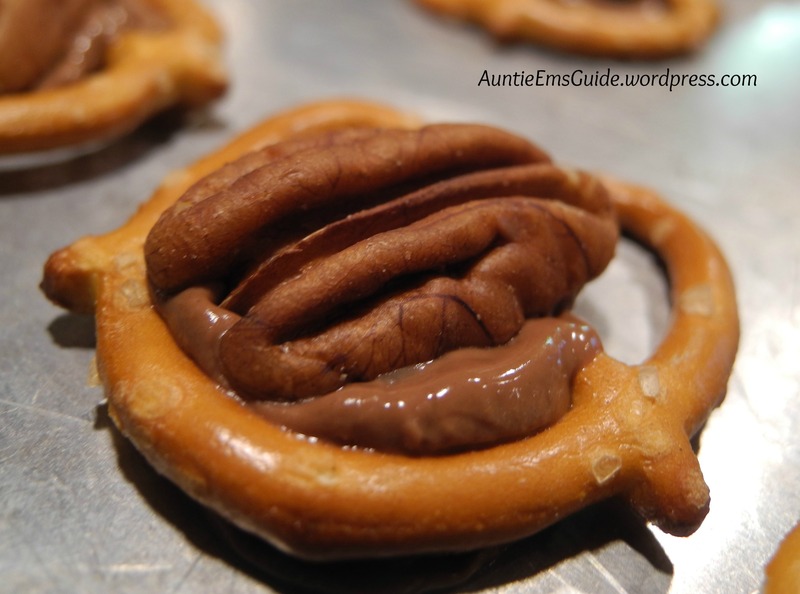 But not too much or the pretzel will break when you try to remove it from the pan! I think I’ll try lining the pan with parchment paper next time. I made a double batch of this dressing, except I neglected to read it ahead of time and and made only ONE double batch of Granny’s cornbread. It was still fine! Since I was cooking so much, I made it a 2-day affair. 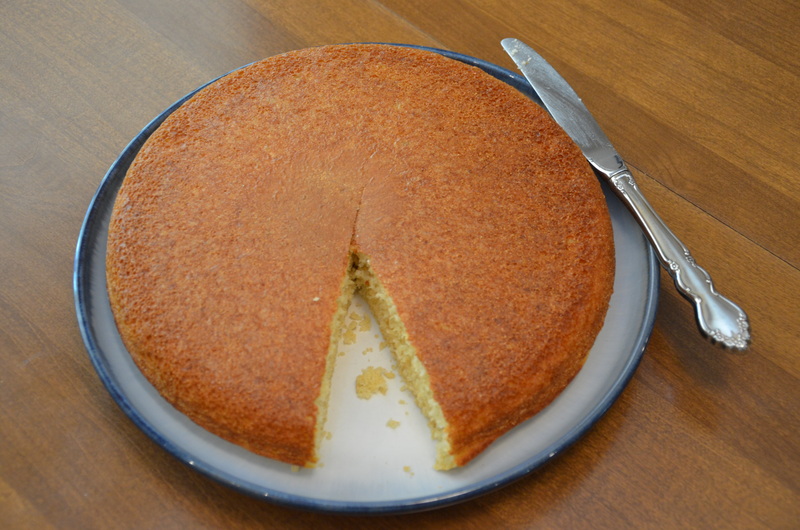 Granny fusses about making the cornbread the day ahead, but she liked it anyway! 1. 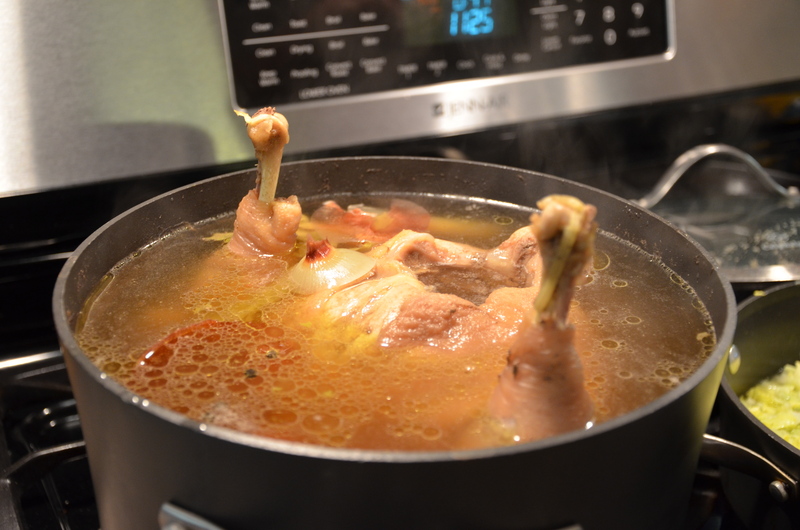 Boil a hen in a large, heavy stockpot. 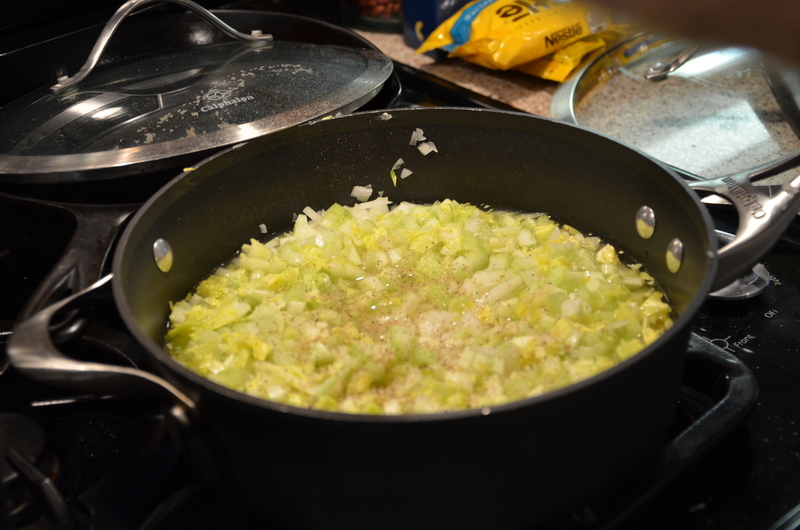 Add salt and pepper, plus the skins and tops of your onions, garlic, and celery to flavor the broth. This will take a LONG TIME. 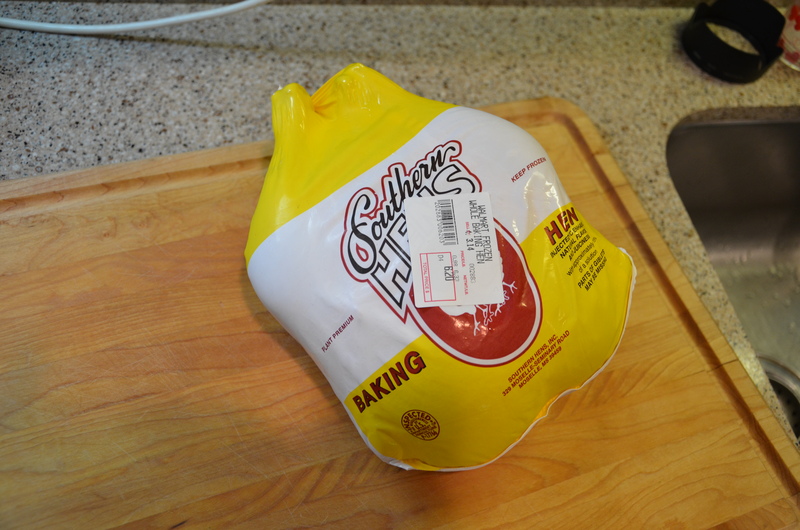 After the water came to a boil, I turned down the heat and covered, cooked her for an hour and she was still tough. 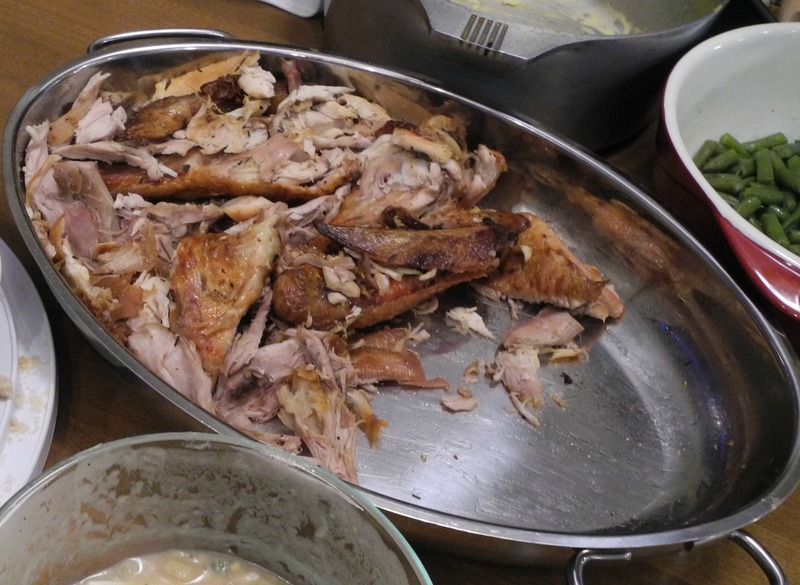 I probably could have cooked her another hour and the meat would have come off the bones a lot easier. Be sure you get a HEN, not just a chicken. You get richer broth and your meat is firmer. Good for gumbo too! 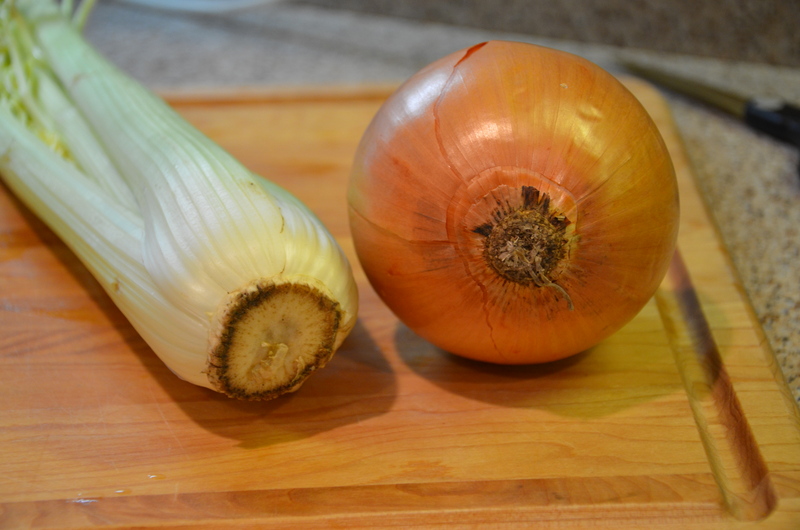 I cut the root ends of the onion and celery off and tossed them; they just looked dirty. 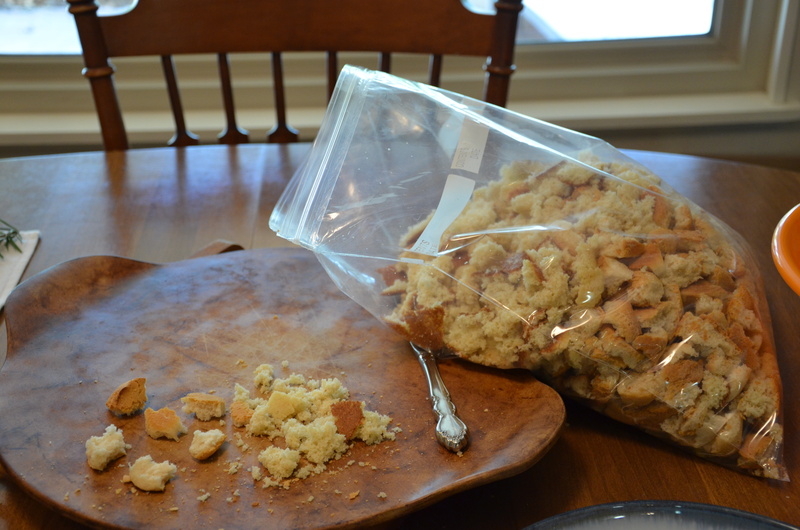 But I put all the rest of the scraps in the pot! Here she is with everything ready to cook. 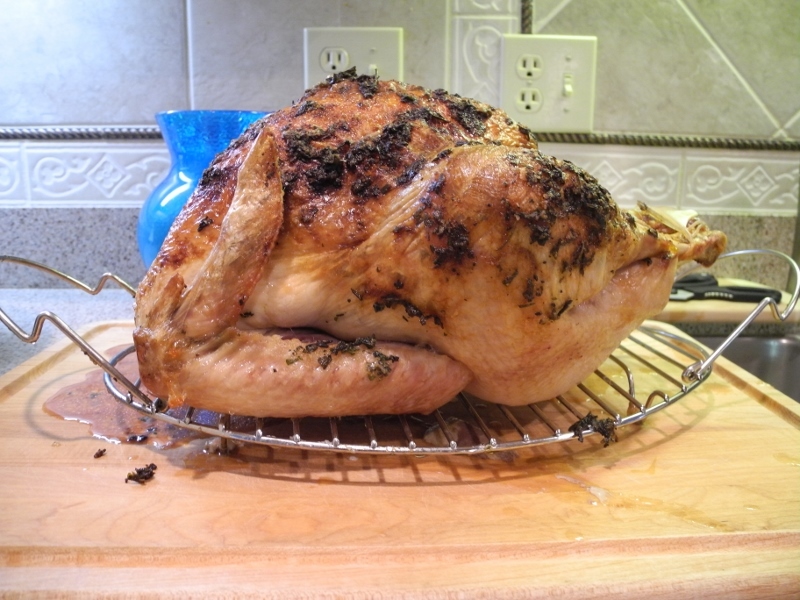 I would have added garlic if I’d had any; I had to use garlic powder. I just thought this was a funny picture. Reminded me of Achilles! 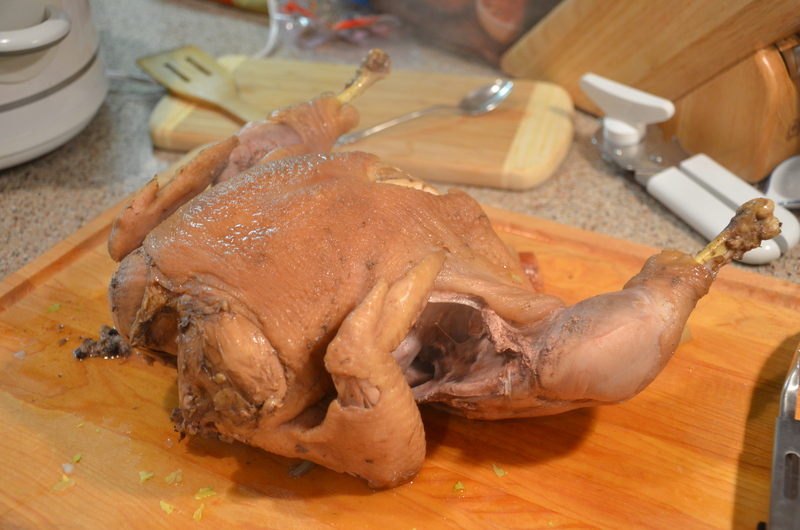 Here’s what she looks like after her swim: Let her cool, then pull off and chop the meat. 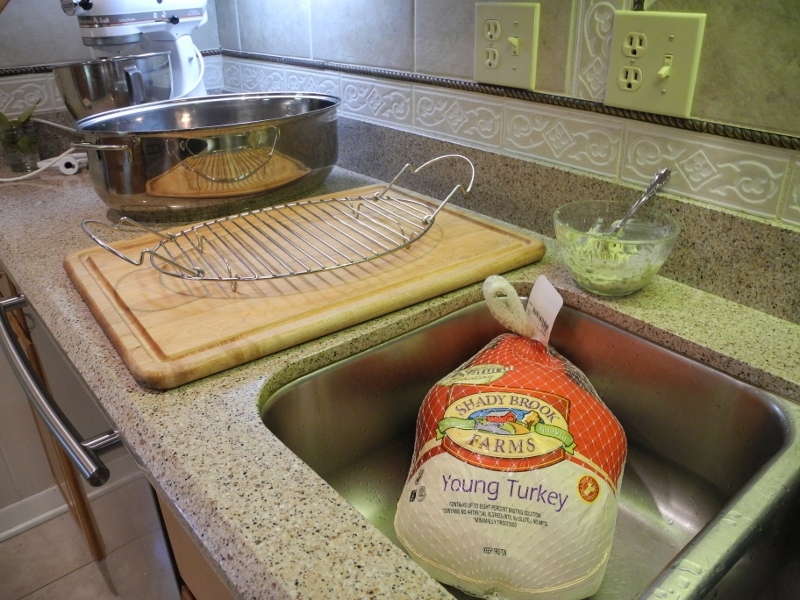 You are going to put the little pieces in the dressing, and lay the breast slices on top. 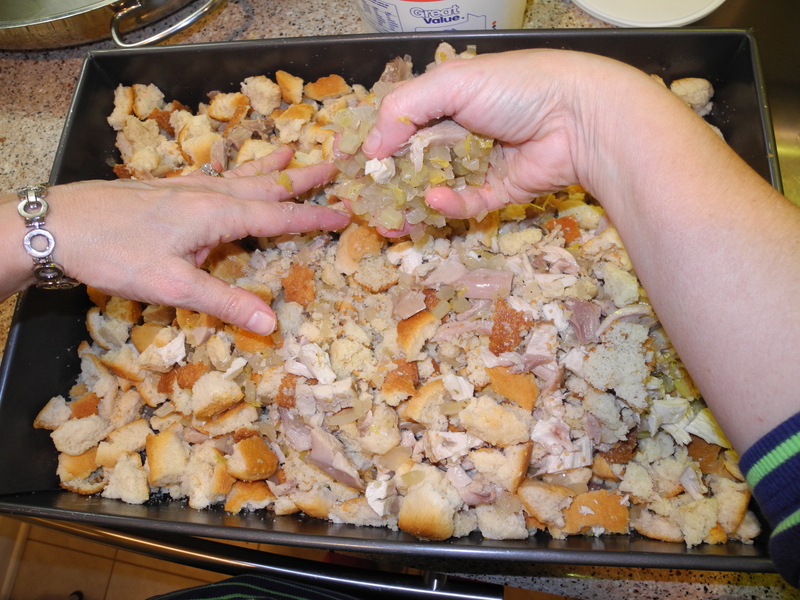 Strain the broth and put in a large container to use to moisten the dressing and make the gravy. 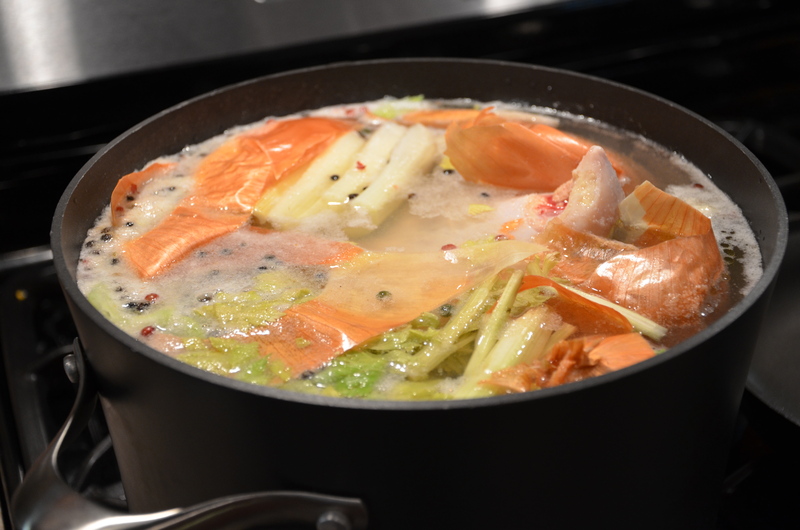 Save the skin and bones for boiling, to get more good broth! 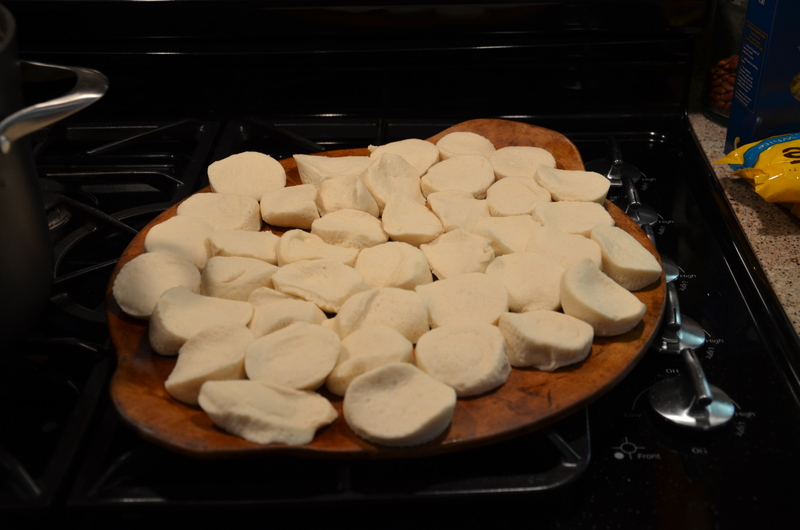 Put them in a freezer bag and freeze them if you don’t want to do it now. 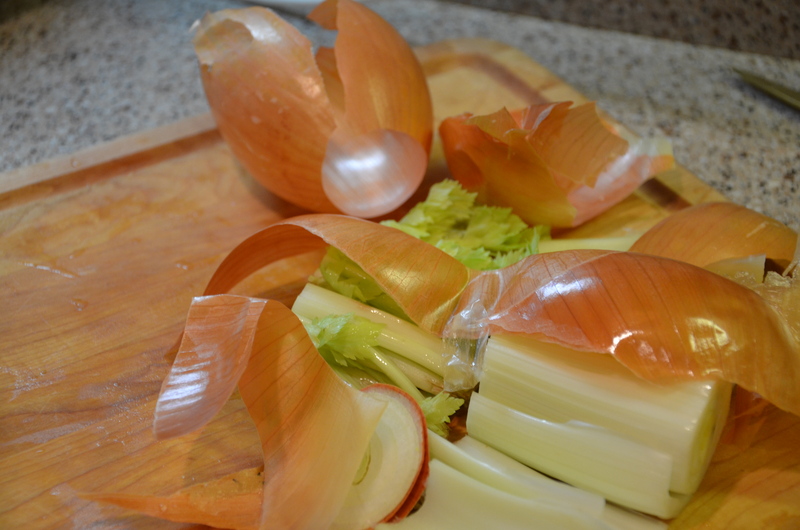 Chop your onion and celery. I had a huge onion and it made almost 4 cups. 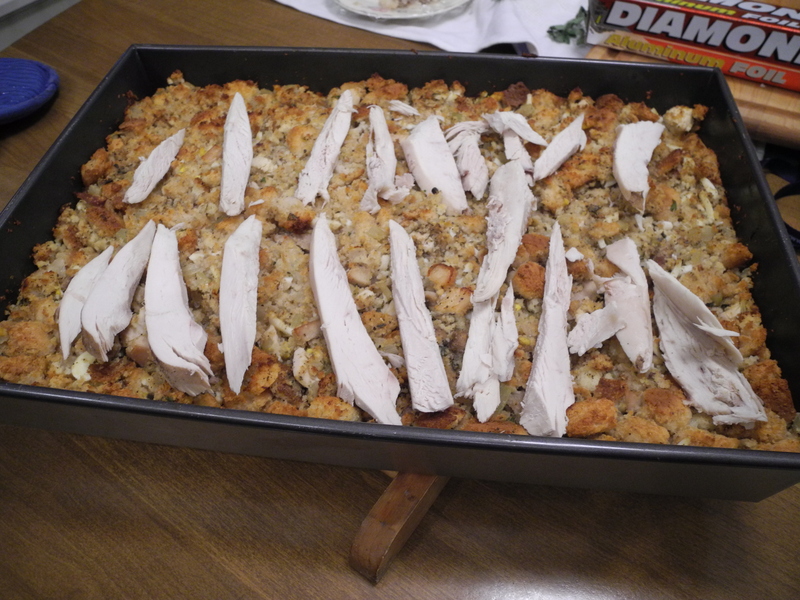 I was very worried , fearing that it would be too much, but it was GOOD! And my 3 cups of chopped celery was the amount the recipe called for. (dumb luck) This time, instead of sautéing in a stick of butter, I used broth (DIET cornbread dressing!) and it worked out fine. Painless ways to cut calories are the way to go. Wait to combine everything until just before you are ready to cook it. 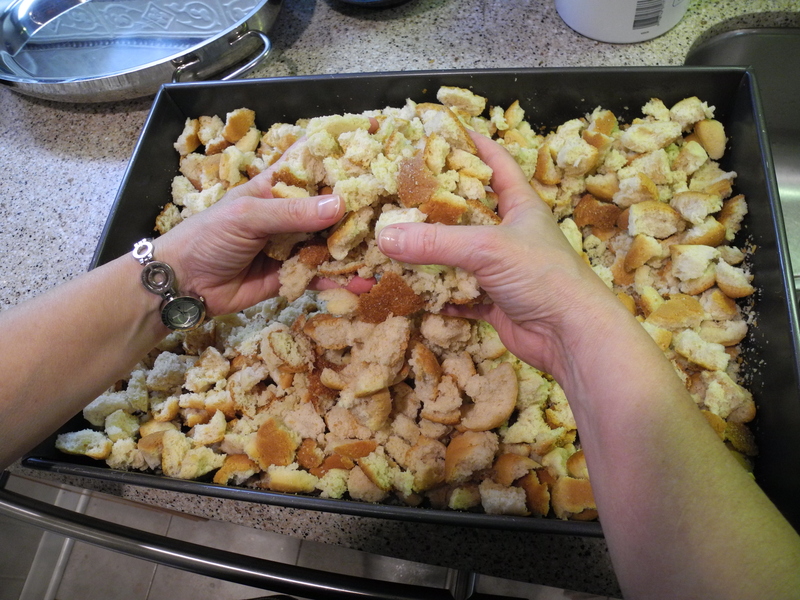 First put the biscuit and cornbread pieces in a large pan. 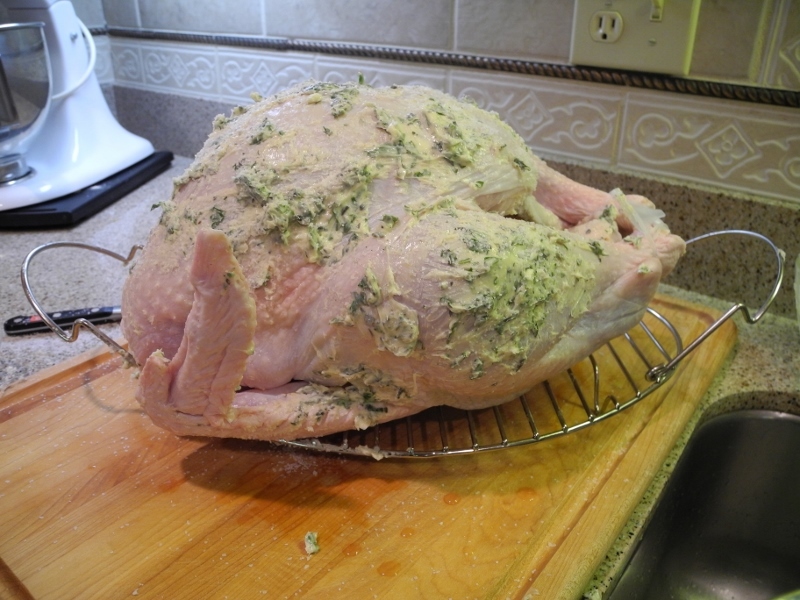 Add salt, pepper, sage, plus basil, rosemary, sage, and parsley. 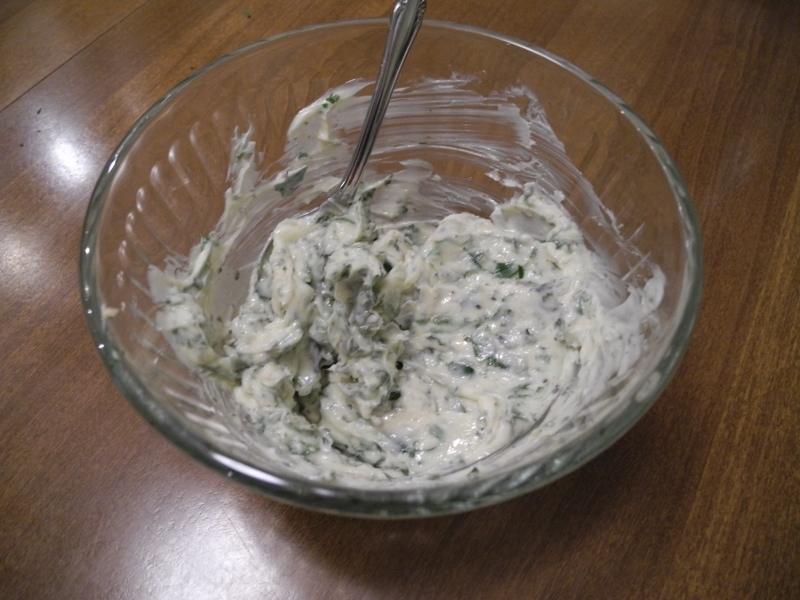 Start with a tablespoon or so of each, depending on your taste. 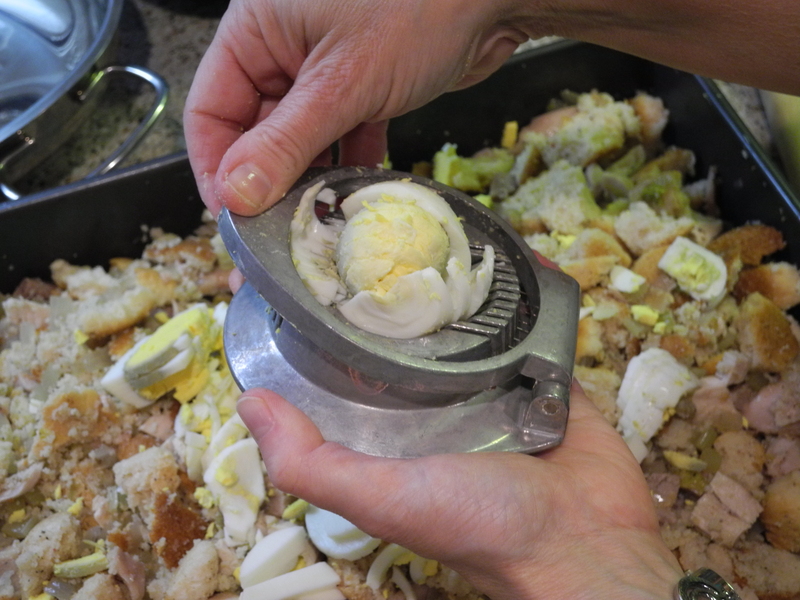 Toss around to mix, then gently mix in chopped hen meat and chopped boiled eggs. Finally, add broth from the hen you boiled. Pour gently over the whole pan. Start with 4-5 cups, and stir gently. All this “stir gently” is to make sure you don’t end up with cornbread dressing mush. And be careful to spread it around evenly but don’t smash it down. Add enough broth to have just a bit standing in the bottom of the pan when you move the bread aside. I used almost 7 cups. Bake at 375 till browned, probably 30-45 minutes. During the last 10-15 minute you can add sliced meat in the top if you like. Ready to go! Recipe below. Gravy tomorrow! Mix all together and gently add 2-4 cups broth . Bake at 375 for 25-40 minutes, till brown.